The “Autodefensas Gaitanistas de Colombia” (AGC), a.k.a. “Clan del Golfo” or “Gulf Clan, is Colombia’s most powerful paramilitary group that controls most of the country’s drug trade. Authorities formally consider the AGC a “Class A Organized Armed Group” and claim the group is the main ally of the powerful Sinaloa Cartel from Mexico. While the AGC didn’t announce its existence until 2008, its origins go back as far as the Medellin Cartel in the 1980s. The group got its initial nickname “Los Urabeños” after 1997 when one of its founders and its current commanders were members of the Centauros Bloc of paramilitary umbrella organization AUC that had embarked on an offensive in the central Colombian Meta and Guaviare provinces. President Juan Manuel Santos in 2014 changed the group’s name to “Clan Usuga,” referring to its current boss, Dario Antonio Usuga, a.k.a. “Otoniel,” a former EPL guerrilla and a former subordinate of co-founder “Don Mario while both were in the AUC. This organization demobilized between 2003 and 2006 after a peace deal with then-President Alvaro Uribe, a long-time promoter of armed civilian self-defense groups. However, when Uribe ordered the arrest of the demobilized paramilitary leadership, co-founder Vicente Castaño considered this betrayal and ordered the Centauros Bloc’s former finance chief “Don Mario” and other mid-level AUC commanders to rearm and retake control of the AUC’s abandoned criminal and military operations. While authorities to this day insist there is no evidence the AUC founder is dead, multiple paramilitary commanders have testified that Castaño was assassinated in Antioquia in 2007. Mario replaced Vicente and retook control over AUC operations in his stomping ground of Antioquia. However, this created tensions with “Los Paisas,” a paramilitary-aligned drug gang founded by former Medellin Cartel capo and AUC commander “Don Berna,” one of the suspected masterminds behind Castaño’s death. Uribe violated the agreement with the AUC in May 2008 again and sent the demobilized AUC leadership, including Berna, to the United States in a surprise extradition operation unauthorized by the court. The AGC then formally announced its existence and started a turf war with “Los Paisas” and “La Oficina de Envigado,” a Medellin-based crime syndicate taken over from founder Pablo Escobar by Berna after his death. The Paisas bartered support from the Cali-based “Los Rastrojos,” but to no avail. Don Mario was arrested in April 2009, after which his lieutenants, the brothers Dario Antonio and Juan de Dios Usuga, known respectively as “Otoniel” and “Giovanni” took over the supreme command of the group. Both had worked under Mario since the late 1990s. Under their leadership, the AGC overpowered “Los Paisas”by taking control of drug routes and territory previously under control of extradited AUC commanders Salvatore Mancuso and “Cuco Vanoy” along the Caribbean coast, and the rackets left by Mario’s imprisoned brother “El Aleman” in Uraba and along the Pacific coast. While authorities in 2010 claimed Don Mario’s group had been dismantled, the AGC continued its territorial expansion all the way to the Venezuelan border. Colombian media reports throughout 2012 estimated the groups grew to have between 1,300 and 2,000 fighters. The group signed peace with La Oficina in 2011, reportedly after mediation by members of the regional political and economic elite, and embarked on an offensive against drug cartel “Los Rastrojos” along the Pacific coast. The AGC has always co-existed peacefully with factions of drug trafficking organization “Los Puntilleros,” which controls most drug trafficking routes from central Colombia to Venezuela and Brazil. The group’s most visible show of force came in January 2012, days after police killed Giovanni in Uraba; Spreading pamphlets across the north of Colombia, the Urabeños virtually shut down all economic activity and public transport in the region. 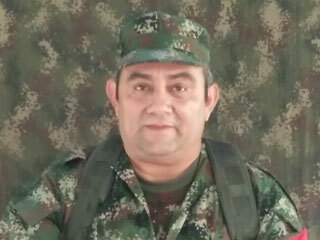 Following the death of Giovanni, another former AUC member, “Mi Sangre,” rose to the top of the organization, initially leading the Urabeños’ contacts in Medellin and later running the group’s international drug contacts. He was arrested in Argentina in October 2012. Otoniel continued to run the organization after his brother’s death and began a territorial offensive down the Pacific coast to usurp territory in control by the Rastrojos that by 2013 had been weakened following the arrest and surrender of all its three founders. Using the long-standing ties with the paramilitaries active in central Colombia, the group slowly increased control in Meta and Guaviare. By then, the AGC had become the country’s top drug trafficking organization with ties to the government as high as governors’ offices and district prosecution offices. In February 2015, Colombia’s security forces began “Operation Agamenon,” the biggest manhunt since Pablo Escobar. More than 2,000 policemen and soldiers have been searching the Uraba region for “Otoniel,” but until today without significant result. The group and its power continued to grow. While peace talks were ongoing with the FARC, the AUC-s former arch enemy and a rival of the group of the AGC, Otoniel recruited even more troops by the end of 2016, when the FARC signed a peace agreement with the government. The Colombian police estimates the AGC had 3,000 members, effectively becoming the country’s largest illegal armed group, but AGC spokesmen “Raul Jaramillo” claimed the group had 8,000 men “including intelligence” personnel. The prosecution said in late 2017 that the office was preparing the possible demobilization of 7,000 armed fighters. During the FARC peace talks, the AGC also began to profile itself more politically, trying to be included in the peace talks with the guerrillas. According to its website, the group formed “in principle as the result of a failed peace process with the Self-Defense Forces of Colombia” and wanted a second chance to demobilize under the same conditions as the guerrillas. 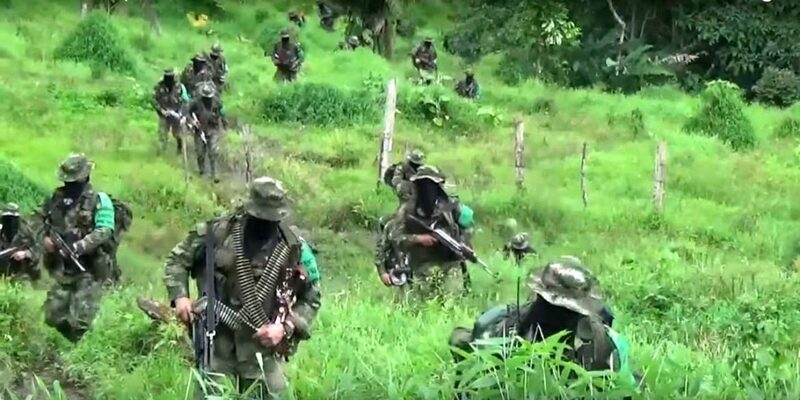 Clashes between the AGC and the ELN, the last-active guerrilla group, have taken place and have forced mass displacement in 2016 in the Bajo Cauca region of Antioquia and along the Pacific coast as far south as the Ecuadorean border. In the rural areas under their control, particularly in Uraba, the paramilitaries began assassinating policemen and around the turn of 2017 the group also took to attacking and burning vehicle owned by private companies. Meanwhile, the group is ruling Uraba and regions along both coasts and do not fear applying terror tactics, forcing farmers to grow coca and miners to dig up gold. The group has been accused of applying terrorist tactics like random assassinations and increases in street crime and extortion to coerce locals into submission to their authorities. Authorities have called the group “Urabeños,” “Clan Usuga” and “Clan del Golfo” and have consistently rejected calling the group a paramilitary organization. In September 2017, the group announced it would be willing to surrender to justice, but under the reported conditions of being shielded from extradition and political guarantees that would allow the formation of new guerrilla and paramilitary groups. Half a year later, the government said to be close to an agreement that would allow the group to demobilize. But when Santos left office in August 2018, the AGC were still in arms and appeared increasingly weary about government failures to comply with the peace deal made with the FARC. By the time President Ivan Duque took over in August, the deal seemed to have disappeared from the table entirely.